Zita lesson number one - don't push the red button. After finding a mysterious device in the rubble of a meteoroid, Zita finds herself on a strange planet looking for her kidnapped best friend Joseph. Zita lesson number two - don't trust strangers. After befriending Piper who wants to help repair the broken remote control, Zita embarks on a journey through foreign lands to a castle where Joseph is being held captive only to find out that her new friend is not all that he seems. Asteroids, monsters, cool stomping boots, this book is adorable. Zita is a spunky heroine that is immediately endearing, and her new friends are loyal and fun. Think The Wizard of Oz on a planet far, far away. Kudos to the fantastic artwork as well. 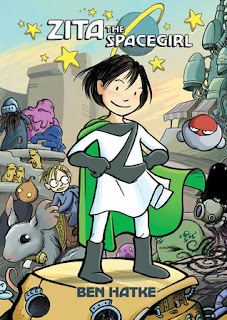 So what if it's shelved in the children's section, Zita the Spacegirl is most definitely a fun read.